Instead of risking my life for a last minute gift, I decided to cozy up to some soy eggnog and browse old newspapers in search of holiday automotive advertising. Below are advertisements from pulled from a variety of 100 year-old newspapers. Grab your spiked egg nog, sit back and enjoy! First we begin with this charming ad from 1914 that says there is no better gift for a man than...clothes?! I am a man. This statement is not true. No real man wants clothes as a gift. If we had it our way our entire wardrobe would consists of sweatpants, hoodies and steel toed boots. Of course a new waistcoat is on my Christmas list...just below mani-pedi and Murano Cabriolet. Question: If Santa is dropping Fords all over the world, who is left with the payments? Hear that moms and dads who don’t know what to get that unruly teenage child of yours? How about...a 2015 MUSTANG! With all his automotive know-how Santa should consider starting a Kinja page: Santa Says – Car Reviews From a Big White Dude. If you spend any time online and are into the automotive world chances are you’ve come across an automotive list of top car gifts this holiday season. They all basically read the same and amount to; a book about cars, car cleaning products, a t-shirt and an expensive watch. The list above is from 1917 and it includes things like driving gloves, radiator ornaments, motor lunch kits and speedometers for Fords. Many of the things on this list seem more like automotive survival tools rather than gifts of pleasure. Then again in 1917 driving a car was basically one big game of survival. Wait, now Santa says drive a Buick? Which is it Santa – a Ford or a Buick? Better yet if Buick is the “gift of gifts” what exactly does that make Cadillac? Your car loves gifts too! Cars weren’t the only automotive thing being hocked in newspapers during the holiday 100 years ago. B) Small child dressed as a can who sits on your bumper waiving at people you pass. The is unclear as to what the product does but it’s great for one reason: it’s written for the automobile enthusiast who treats his car like a person who needs attention, love and oh, gifts (an ongoing theme here - the need for gifts). “You’ve probably thought of everybody and remembered with a gift – now how about your car?” – the ad says. And who wouldn’t want less sass from their wife car in the morning? SUPER Motor Fuel? Try LIGHTNING in your engine! This appears to be another ad for more gas tank Red Bull. There’s zero text associated with this ad but I believe, based on the image alone, that this Benjamin Franklin-looking fella is taking the power of lighting (because Benjamin Franklin) and putting it into a small bottle that you purchase to put into your car’s engine. At least I think that is what is being portrayed here. Today this could also very easily be an artist rendition of Elon Musk creating the next Tesla. Curious if people 100 years ago were buying into the whole octane booster marketing thing or was this just how Big Oil sold what we call Premium Fuel today? Wait! Did we mention - cars are great gift ideas! I can’t think of a better Christmas present than a new car, especially one that will hit THIRTY FOUR HUNDRED REVOLUTIONS PER MINUTE and seat five people. This is proof that the car as a Christmas gift pitch has been around for at least 100 years. I’m sure if I went back farther I would find an add for a glue factory recommending you trade in your tired old horse. The problem with automakers and the whole car gift is they never show you the whole story. Those commercials where the striking square-jawed man pulls up in a red-bowed Lexus greeting his beautiful wife in the driveway always omits the two weeks leading up to that day he spent begging her to let him upgrade her Dodge Nitro she held on to after college because she thought it was cute. Not only does this ad suggest once again that a new car is the best gift, but it puts it on par with the dollar store trinkets and bottom-shelf candy you’d stuff into a stocking. That’s lower than a gift. “Place a Buick in the family stocking this Christmas” the ad says. So if cars are stocking stuffers what’s next - deed to a new home under the tree? Sorry about that delay, we were saving the world from tyranny. Now, let’s get that battery of yours serviced! Automotive gifts extend to women as well. 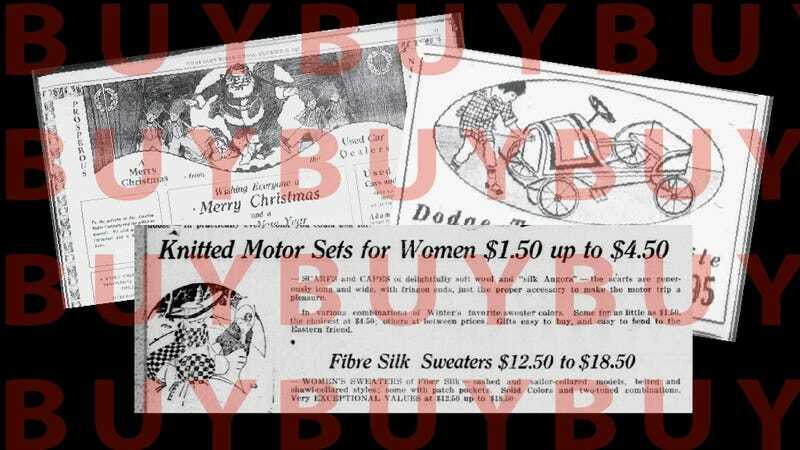 Take this ad highlighting “knitted motor sets” design for motoring women. These motor sets consisted of scarfs and capes that were considered essential for a woman during her motoring pleasure as a passenger. Unlike the plastic Made in China crap people will plop their kids in and GoPro to death this Christmas, this was a Made-In-America toy car, complete with adjustable seats, rubber wheels and enameled stripes (likely on top of lead paint). The price of this car, $6.95. When adjusted for inflation comes to $161.98. For a real toy car, made from real parts, this wasn’t a bad deal at all seeing that parents will spend over $250 dollars for a plastic battery-powered Corvette for their kid. As you can see, even 100 year ago automakers and their advertisers were convinced that Christmas, while about many things, was the perfect time to purchase a new car. Now, get out there and buy your wife a new cape and you a new Miata. The world of winter motoring awaits! PS – Don’t forget the SUPER Motor Fuel.